In partnership with Bloomington, Indiana Fire Department Africa Fire Mission was able to send gloves, flashlights and a few other safety items as 4 Bloomington Firefighters worked in Freetown with thier firefighters. We look forward to other opportunties to partner in Sierra Leone in the future! 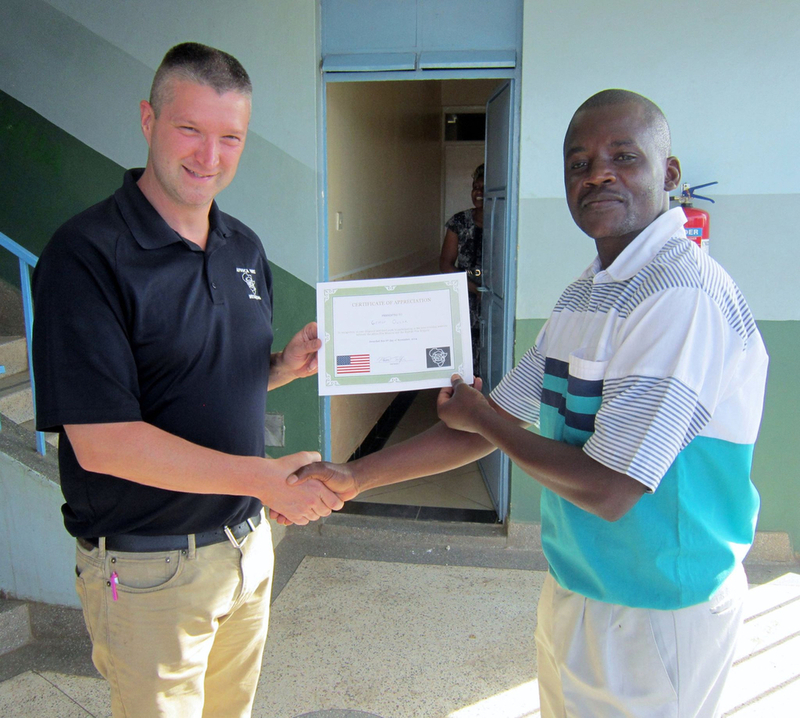 AFM instructors arrived in Kenya to conduct the 3rd All Kenya Fire Academy in Thika, Kiambu County, Kenya. The academy planning committee did an amazing job planning for the academy. Over 200 firefighters attended the academy in the immediate aftermath of a presidential election in Kenya. 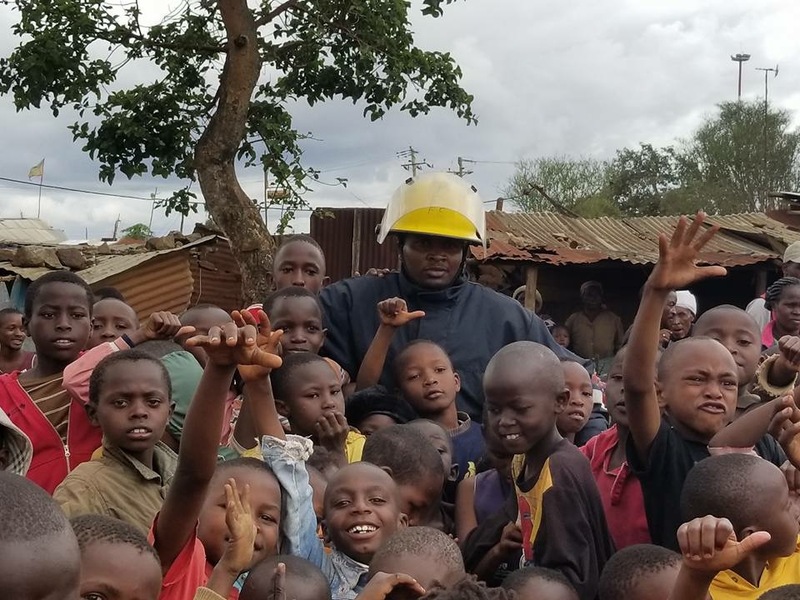 Firefighters from all corners of Kenya, of all different political views, tribes and faiths came together to learn and discover how to even better serve their communities. 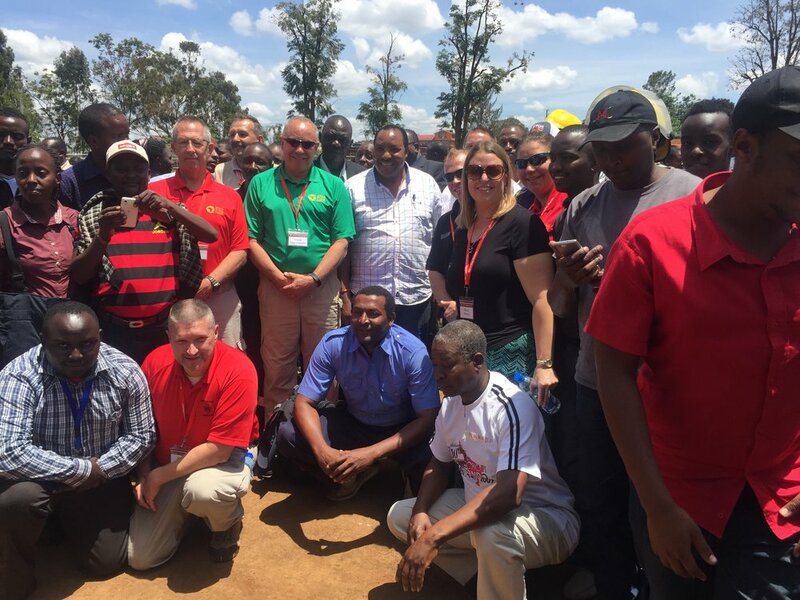 The Kenya Council of EMT's joined Africa Fire Mission to train firefighters in basic medical care, while our team taught classes on leadership, community fire prevention/ education and conducted a hands-on class for new firefighters. Daily devotions started each day and a bible study concluded the day. 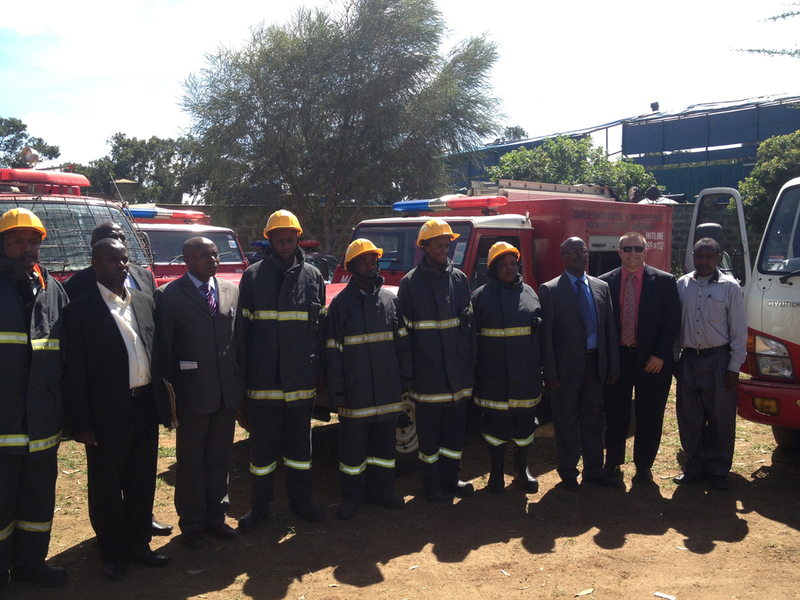 The fire academy was opened with a grand opening ceremony attended by the governor of Kiambu County and the academy ended with the firefighters participating in their FIRST ever full-scale emergency drill that featured live fires, a rowdy crowd of community members (replicating the attitudes and beliefs of the communities where the firefighters serve) and victims in need of rescue. We closed the 3rd All Kenya Fire Academy with a graduation celebration full of songs, dancing, certificates, handshakes and hugs. Malawi is one of most beautiful places in the world and also one of the poorest. Landlocked in south-central Africa it is a heavily agrarian country that is prone to food insecurity (famine) and long-term power outages. Nancy and I visited Malawi for 3 weeks in May at the invitation of Namikango Mission to explore how Africa Fire Mission could serve Malawi and partner with Namikango as a way to help their mission connect to the community. Missionaries Ryan and Justine had previously served at Missions of Hope in Kenya before moving to serve in Malawi 3 years ago. 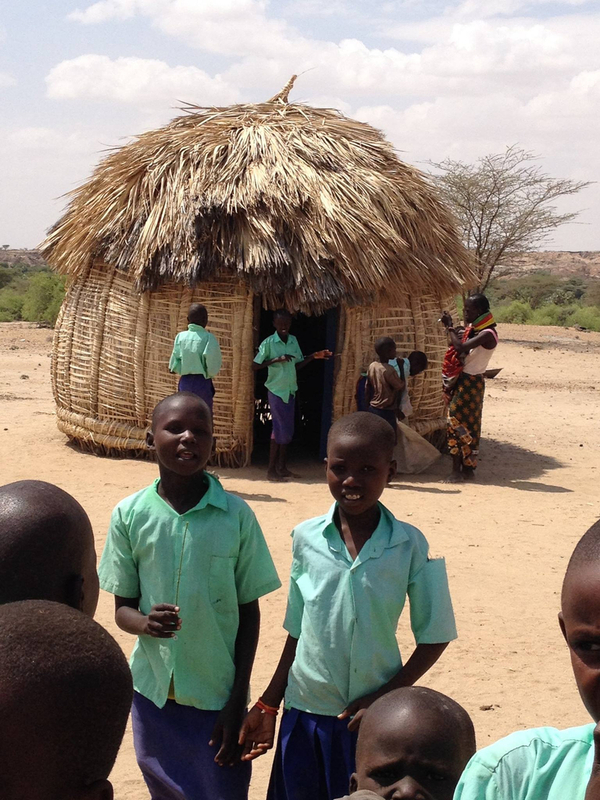 They had seen the impact AFM and MOHI had on the Mathare Valley and hoped to do the same in Malawi. 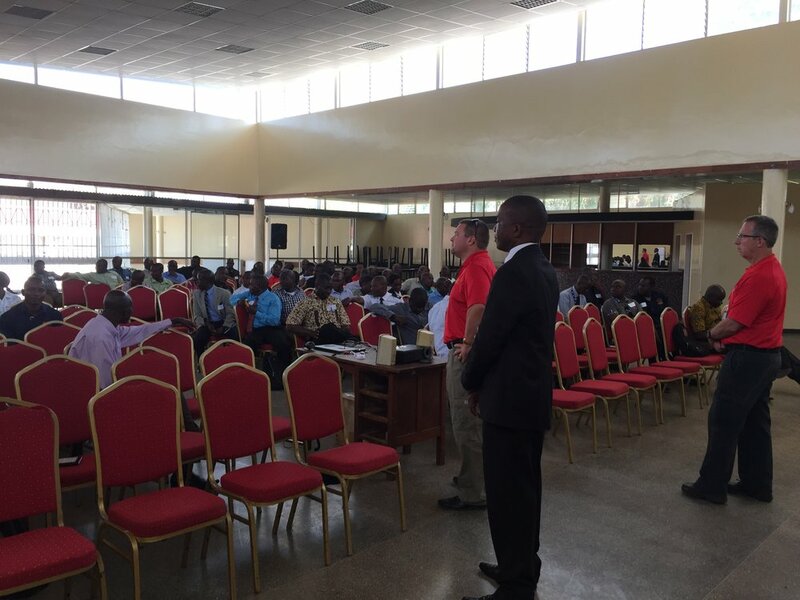 While in Malawi, we met with fire service leaders across the country to find ways AFM could minister to them. We learned that in Malawi, a country roughly the size of Pennsylvania, there are only FOUR fire departments and roughly 200 firefighters. Pennsylvania along has over 1800 fire departments. 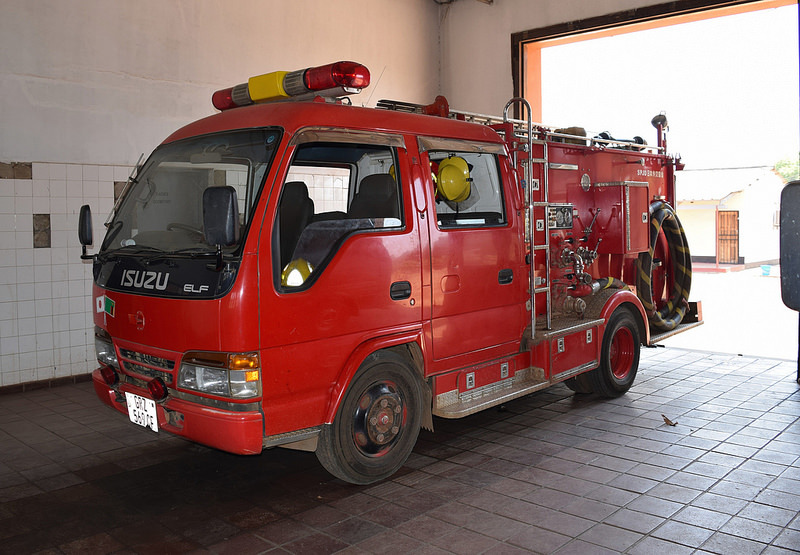 The country of Malawi has never bought any of their own fire trucks or fire equipment. They have relied on aid from the UK and Japan but they wish to change this. They wish to provide the services their communities needs with the right kind of equipment. The leaders are smart and know what it take to move forward but they just need some support and encouragement which Africa Fire Mission will be providing. 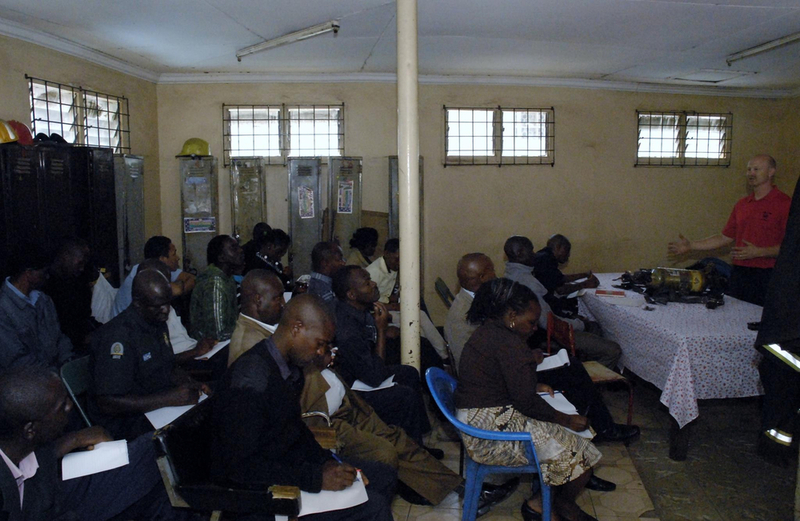 The fire service leaders were impressed by the CHE curriculum that AFM has developed and were thrilled that we were able to train them and provide them copies of the training so that they could immediately go out in the communities and share the messages of both fire safety and God's love. Moving forward, as a first step, we have invited the fire service from Malawi to attend the 2nd All Zambia Fire Academy in Lusaka this September. Zambia is a neighboring country and they Malawians a striving to emulate the successes that have occurred in the fire services across Zambia. 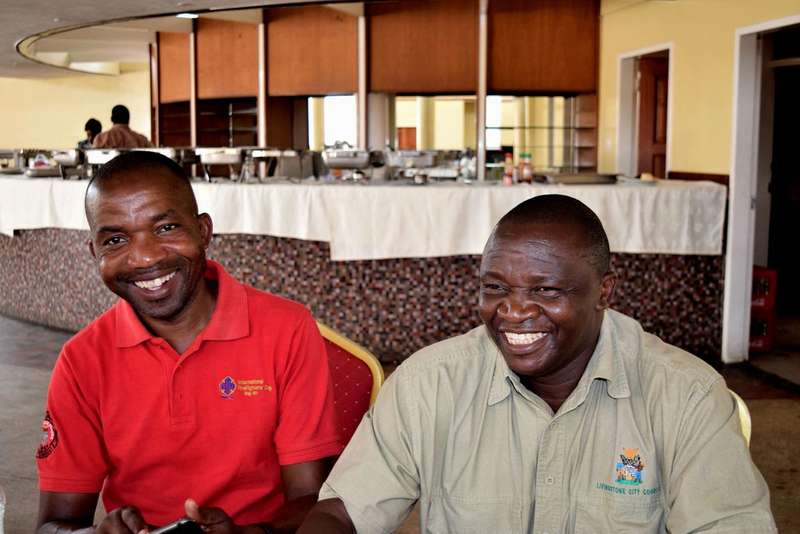 We are looking forward to connecting our partners in Zambia and Malawi together as we all work to collaborate and provide strong and effective fire prevention and response services that will keep people safe! 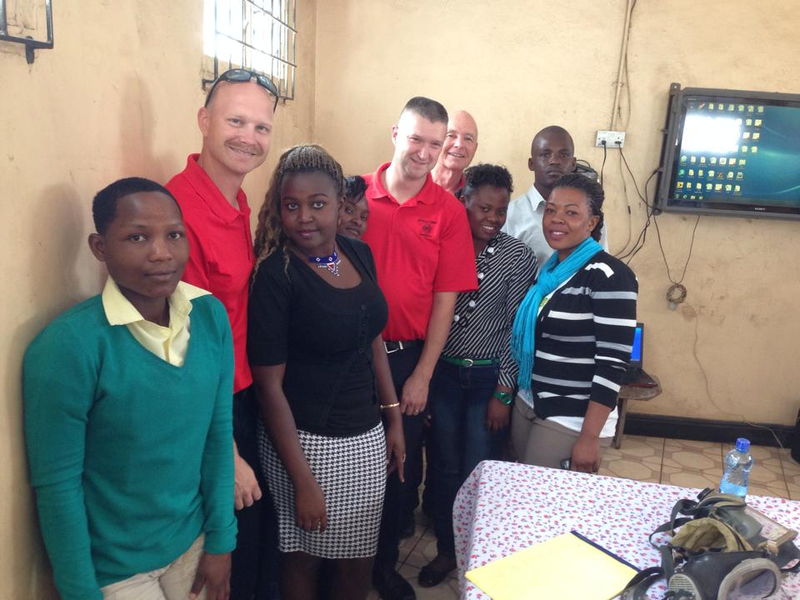 Dave & Nancy spent two weeks in Kenya to plan for the fall, to develop new fire prevention curriculum and to work with Missions of Hope to complete a student assessment platform. We met with stakeholders from last year’s academy to review the accomplishments and to plan for this year’s academy. Topics were chosen for the 2017 academy, the location of the academy was secured, Thika Stadium, and partnerships were strengthened. We also had the opportunity to donate an air compressor that can be used to fill firefighter breathing apparatus to the Machakos County Fire Brigade thanks to our partners MSA and High Pressure Systems. Our 2016 All Kenya Fire Academy trained over 230 Kenyan and Ugandan Firefighters in Machakos County, Kenya. We offered training in Fire Service Leadership, Community Fire Prevention & Response and Emergency Medical Services (including CPR & basic first aid). 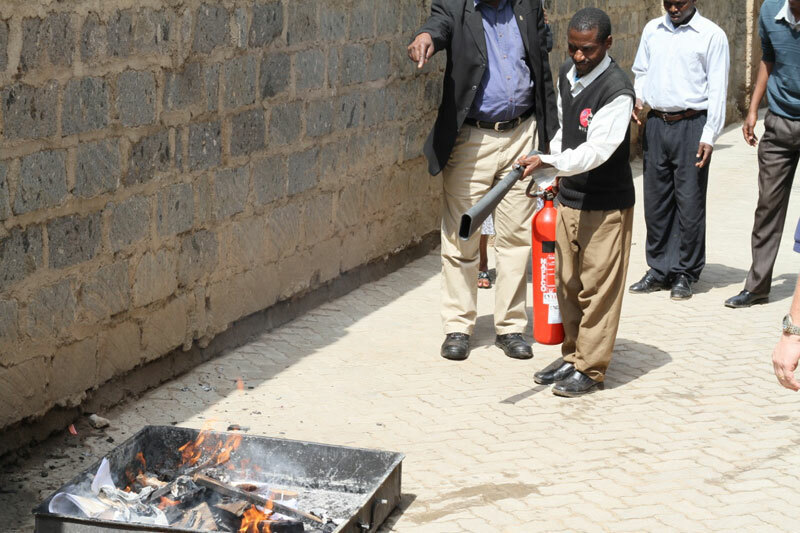 During the academy we rolled out our brand new fire prevention curriculum to the attendees and by the end of the week hundreds of community members in Machakos and Nairobi were trained in fire prevention and community fire response techniques. Our team of 11 instructors were joined by two Polish Fire Trainers and a video crew of the Discovery Channel who recorded a day of the academy for inclusion in an upcoming Discovery Channel Documentary about the impact of global warming on disaster response. The week concluded with a formal graduation ceremony. Local officials spoke and the students were given blessings from both local pastor and Imam. All the students received certificates of accomplishment and a gift from Africa Fire Mission and the Fellowship of Christian Firefighters. Additionally, we trained nearly 50 CHE trainers and Community members in the Mathare Valley in our Community Health Evangelism Fire Prevention Curriculum Missions of Hope International is facilitating a community fire prevention team with CHE community members that will continue to train others in the community. During September, Dan and Cindy Mack and Stacey Daniel traveled to Zambia as part of AFM's ongoing work there. Dan and Cindy were in Livingstone, where Dan conducted several seminars on various topics to the fire brigades in that area. 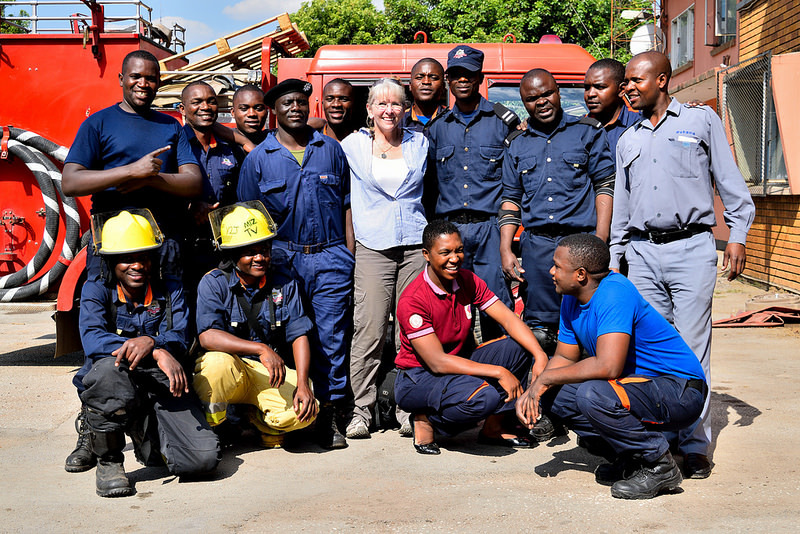 Stacey spent time visiting with the firefighters and chief officers in Lusaka before headings to Kabwe and the fire academy there. 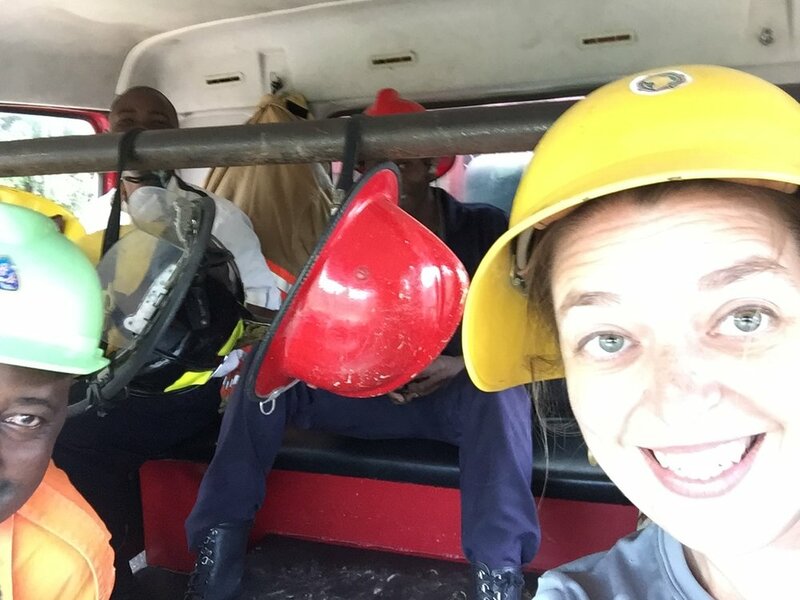 While Stacey was in Kabwe, she investigated the details needed to move forward on a project to drill a well at the fire academy that would support fire hydrants at the fire academy. She also had the honor to inspect the firefighters in Kabwe and to see a presentation by their honor guard that they subsequently named in her honor, The Stacey Daniel Honor Guard. 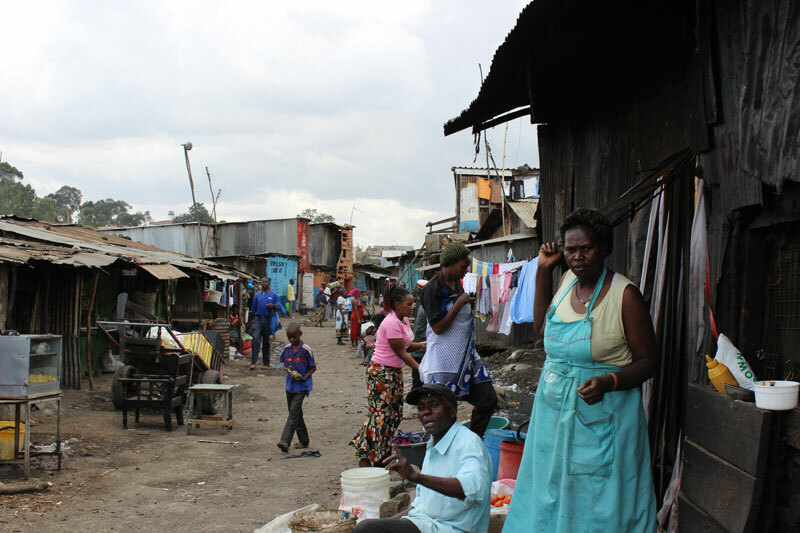 During this mission, Dave & Nancy Moore spent a day in the Huruma Community of the Mathare Valley, visiting Huruma Hope Outreach Church and the site of the recent building collapse. They got a first hand look at the incredible desperation & despair in that place and were able to pray with the church for the community. They heard account of the survivors and of families of those who died, some of who's bodies will never be recovered. AFM donated rescue gloves & eye protection to the responders to the collapse as well as provided additional training resources to the counselors working with the families impacted. Thanks to a $3000 grant from IDES, Africa Fire Mission will be able to greatly increase the amount of rescue gloves & other protective equipment being given to the responders as well as counseling support materials that can be provided to the responders & families. They worked with the Kenyan planning committee for the upcoming All Kenya Fire Academy and were pleased with significant progress in making plans to improve communication & advocacy for the Kenya Fire Services. In Livingstone, Zambia Dave & Nancy provided a one day seminar for Zambian Firefighters and spent three days working with a newly developed organization -Campaign for a Fire Free Zambia - which was started after our October mission - in order to better advocate for the needs of firefighters & fire brigades as well as provide community fire prevention & sensitization programs. They had the privilege of visiting several fire brigades to encourage them & see gear donated last October being put to good use. 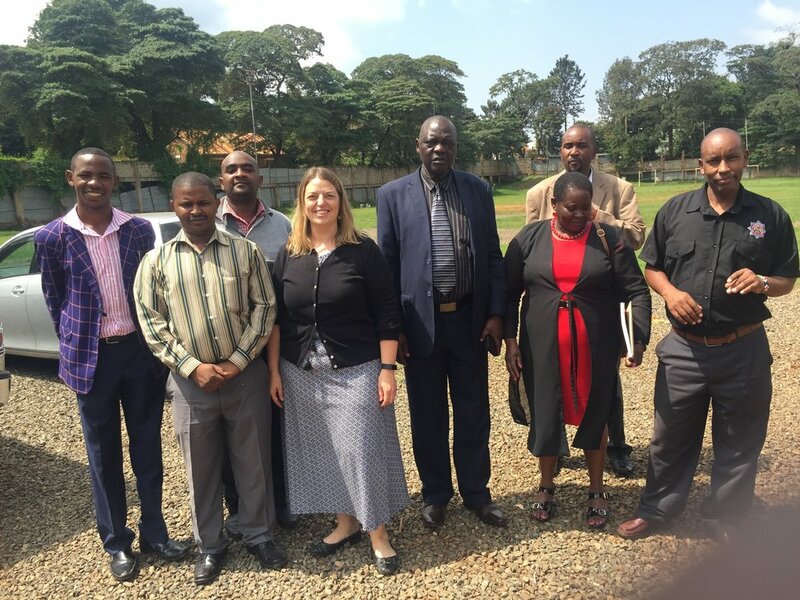 Back in Nairobi, Kenya, Nancy was able to make significant progress on the CHE Fire Prevention Curriculum, working closely with the Missions of Hope (MoHI) CHE Trainers identify additional needs for fire prevention and response in the communities. She also worked with MoHI social workers to review progress with the assessment tool that has been developed to help measure change in the MoHI family's lives. May was a very productice and full Mission & we are thankful for your partnership in helping it happen! 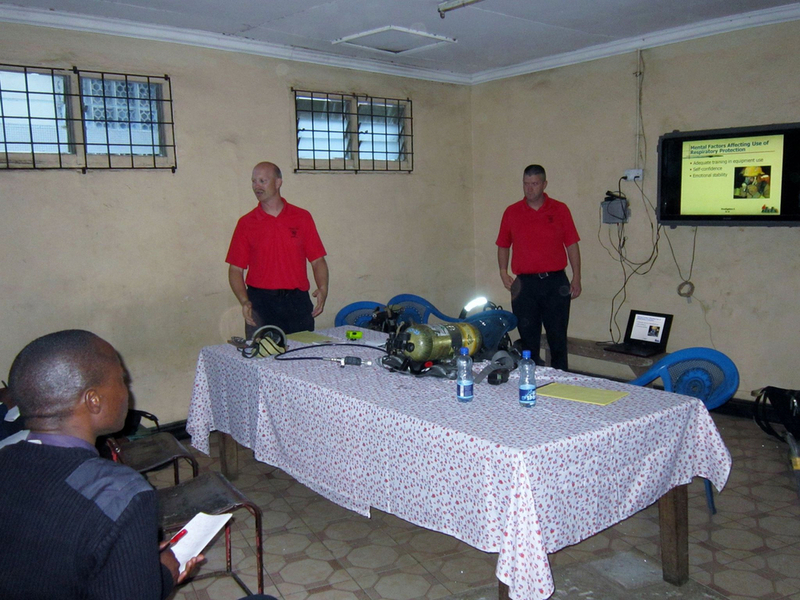 In November, 21 Africa Fire Mission team members traveled to Kenya to facilitate the first ever All Kenya Fire Academy. 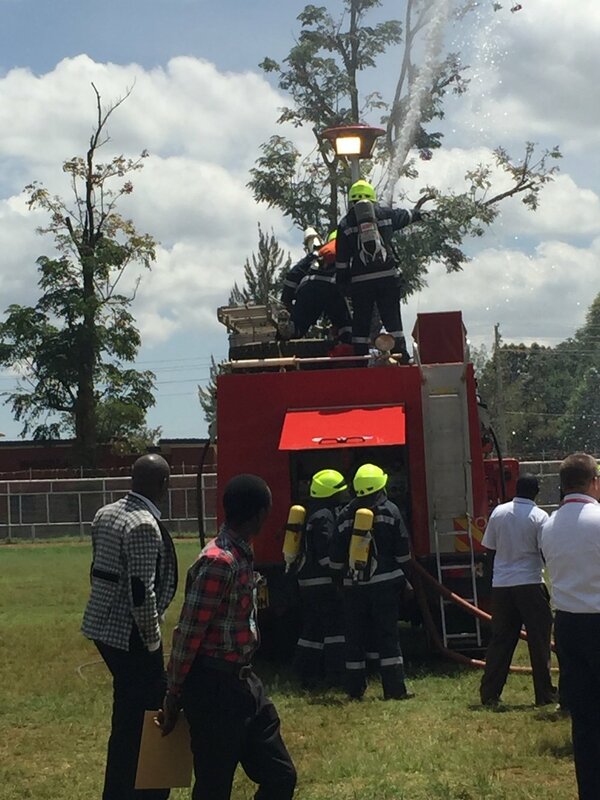 Africa Fire Mission partnered with Missions of Hope International, Kenya Airport Authority and the Kenya National Fire Brigades Association to train nearly 250 Kenyan firefighters, chief officers and disaster responders. Our team of 21 came together from all across the United States and was made up of career and volunteers firefighters, company officers and chiefs. Together we taught courses in Community Fire Prevention and Response, Senior Leadership Development, Fire Investigation and Urban Search and Rescue. 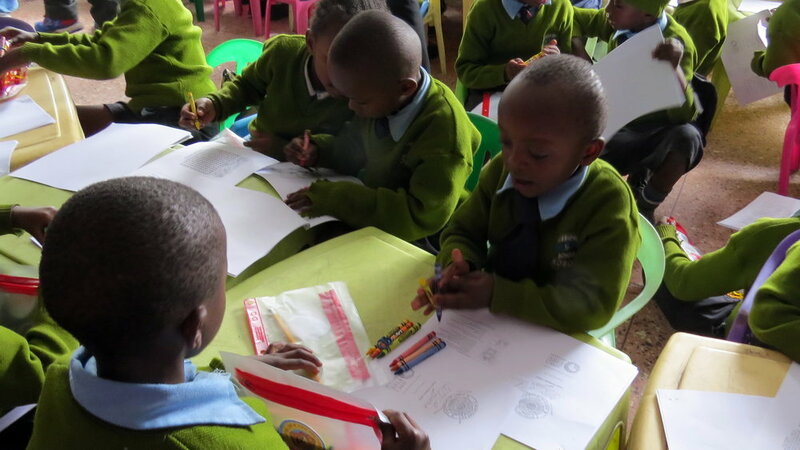 Classes were held at the Jomo Kenyatta International Airport and Mission of Hope International's Kosovo School in the Mathare Valley of Nairobi. Attendees of the training come from all across Kenya including 22 of the 47 counties; several national organizations, NGO's and 1 person joined us from the Country of Uganda. 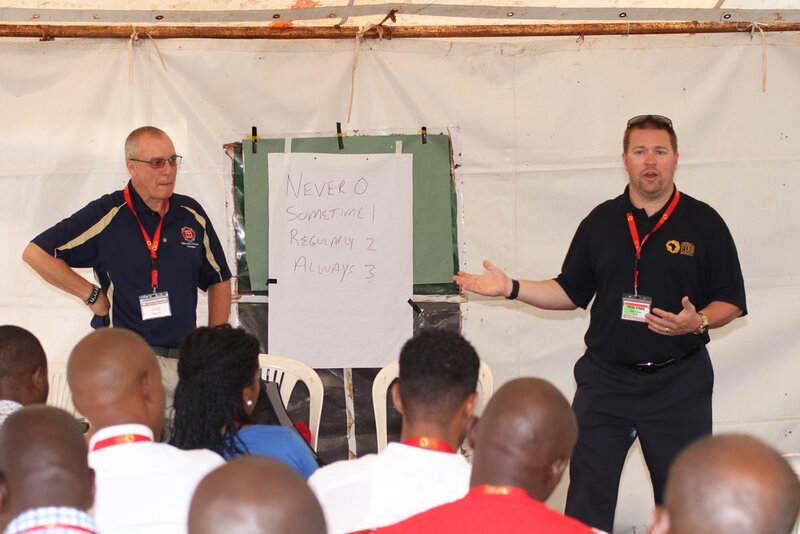 Throughout the week, our instructor cadre was able to share their knowledge and experiences to help the Kenyan students take what they learned during the week back to their homes and share it with those firefighters who could not attend the academy. Our instructors teaching hands on portions of the training used tools that were already in use in Kenya to accomplish many of the tasks while also introducing new tools and techniques that could be useful as well. We had use of a building that was being deconstructed and a rubble pile at the airport. Our classes were able to use these areas to build a burn cell for the fire investigation class so that they could study burn patters and to simulate rescuing victims from collapsed buildings. Our senior leadership class shared strategies for leadership success and spent time working in small groups to address real life issues facing the Kenyan leaders. Our community prevention and response class spent the week training at the Missions of Hope Kosovo Center in the Mathare Valley. They shared prevention strategies as well as basic fire suppression skills with the fire department and community members. On Thursday morning, local community members brought a man who had been stabbed in the neck to our team for help. One of the fire departments taking the training had driven an ambulance. 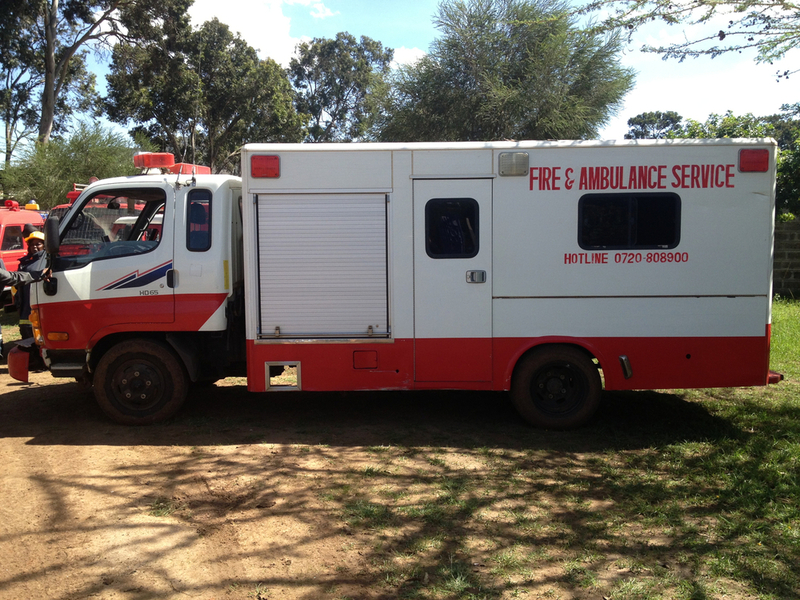 As our team members began rendering aid to the injured man, the ambulance was able to find directions to a hospital. Our team was able to render life saving aid and rush the man to the hospital where he was able to receive treatment for his injuries that he never could have received in the slums. Later that same afternoon a fire broke out in the community near the Kosovo School. The area where the fire was burning was to dangerous for our instructors to go to but Kenyan students were able to rush to the scene where they began fighting the fire until the fire department could arrive. The Kenyan students were able to pull a mom and a baby from a burning home. This quick action saved lives and limited the damage to only about 10 homes when often fires like this regularly damage 100 homes or more. Using our CHE based training approach we were able to meet both the physical and spiritual needs of the students and community members we taught. We are already developing plans for our return trip to Kenya in November of 2016 to continue building the capacity of the Kenyan fire brigades and the relationships between the governments and Missions of Hope International. 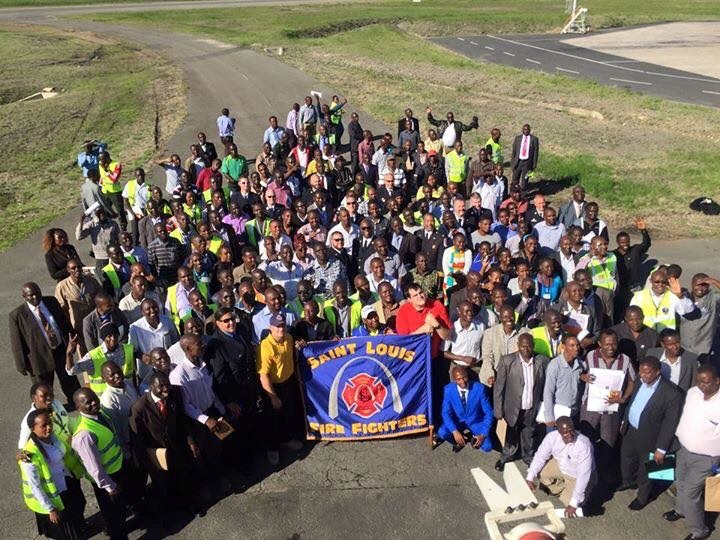 In October 2015, Africa Fire Mission expanded our work into the country of Zambia. Our 4-person vision team spent the week learning about the needs of the fire and disaster services in Zambia, meeting with various mission organizations, governmental agencies and individuals and training firefighters and school staff. This summer, we packed a 40' shipping container full of medical supplies, fire equipment and food and shipped it to Lusaka, Zambia. During our trip, we were able to deliver a container and it supplies to the beneficiaries. The container arrived fully intact and early 40 fire departments were outfitted with personal protective equipment for their firefighters. Two medical clinics received much needed supplies to upgrade the services they offer to their communities and much needed food was supplied to the Kids Alive Orphanages thanks to our partners at IDES and FAME. 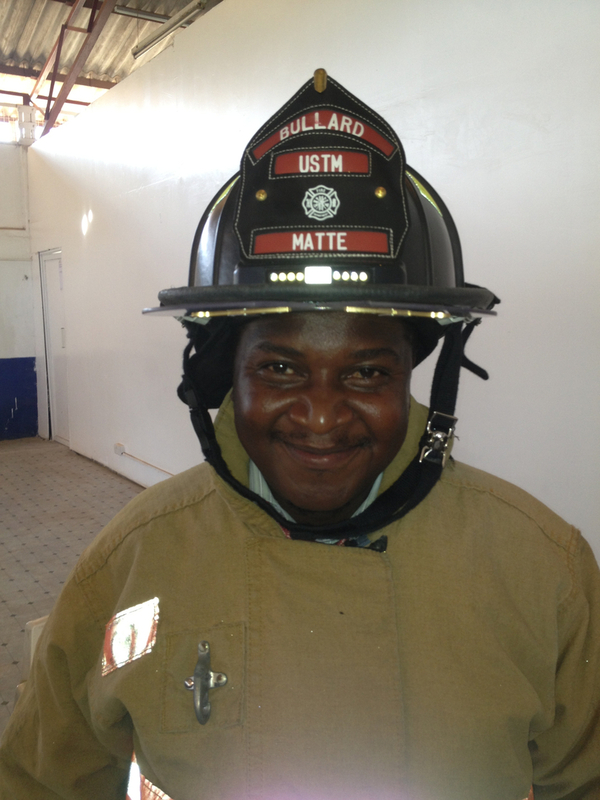 Throughout the week, our team spent 3.5 days training fire departments trainers from all across Zambia. 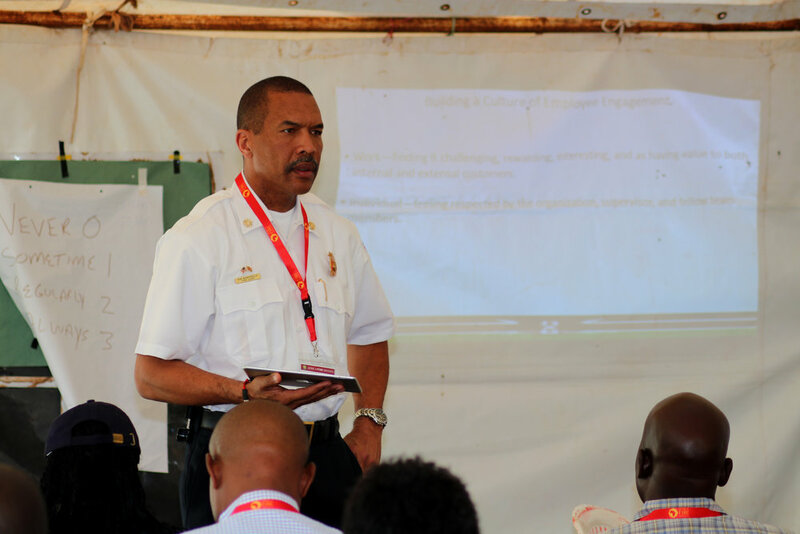 Over 135 firefighters from every department in the country received training in several topics areas including fire prevention and Community Health Evangelism (CHE). Though training and personal conversations, we had the opportunity to share our faith. We also had the opportunity to spend several days at the Kids Alive center in Lusaka. We learned about how they work with children in the slums to educate them and share Jesus in the communities. Nancy had the opportunity to train Kids Alive staff using CHE and encourage them as they work with the children at their two centers. The mission wrapped up with a grand ceremony, provided by our partners in the Zambian Fire Services, at the Lusaka International Airport to formally recognize the donation of the training and equipment. Representatives from our mission partners, the US Embassy and dozens of Zambian governmental agencies, including the Minster of Housing and Local Government attended. The ceremony included speeches, prayers and thanksgiving and some amazing traditional African storytelling and dance. Additional training and supplies are needed to continue empowering the Zambians to continue developing programs that meet the needs of the communities and children they serve. AFM is actively planning for our return trip to Zambia. We are very pleased with the active stance taken by our new partners in Zambia to make the next steps in our expansion a reality and an ongoing partnership. actively planning for our return trip to Zambia. We are very pleased with the active stance taken by our new partners in Zambia to make the next steps in our expansion a reality and an ongoing partnership. 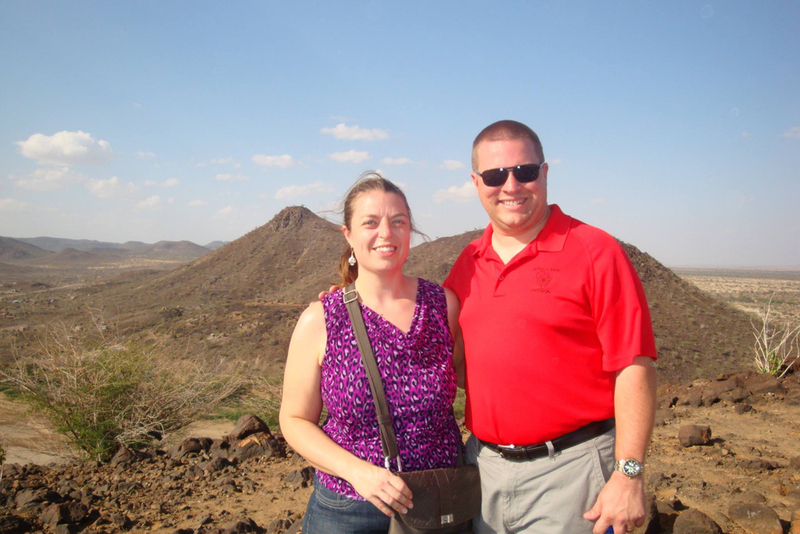 In May 2015, Dave and Nancy more traveled once again to Nairobi, Kenya to continue planning, preparing and raising support for the first ever All Kenya Fire Academy. 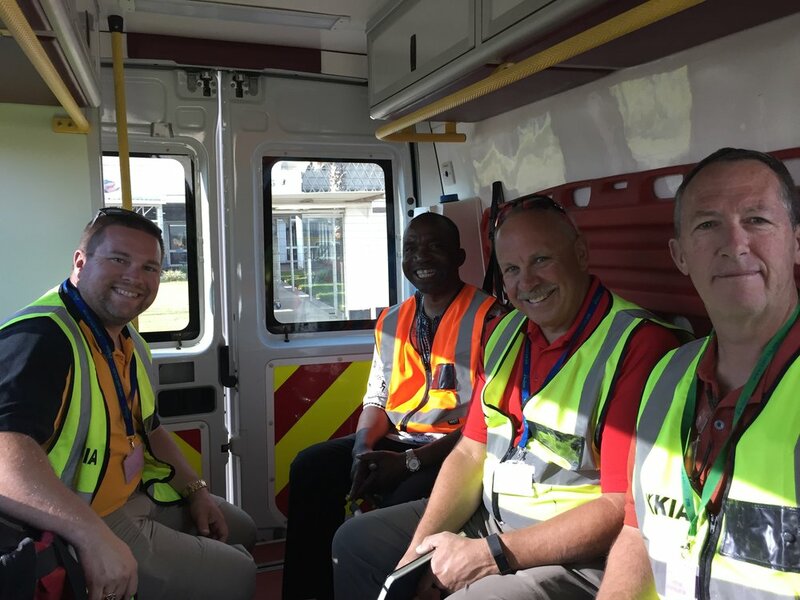 During this trip, they had the opportunity to travel to the coastal area of Kenya to better understand the challenges facing emergency responders across Kenya. Upon returning to Nairobi, they once again met with the Kenyan Stakeholders to continue preparations for the training that would be conducted in November 2015. Meetings were held at both Missions of Hope International's Pangani Center and the Jomo Kenyatta International Airport. The Kenya National Fire Brigade Association coordinated a meeting of many of the senior chief fire officers from across the country at the Pangani Center. During this meeting, AFM lead a collaboration exercise among the officers to determine what were the greatest training needs for emergency responders in Kenya. As a result of these meetings, it was determined those topics were: Fire Prevention and Community Response, Fire Investigation, Urban Search and Rescue and Senior Leadership Development. Together with the Kenyan Stakeholders, AFM continued to work with governmental agencies to raise the support and awareness needed to allow the emergency responders across Kenya to increase their capabilities to prevent and mitigate emergencies. Additionally, a new draft of the fire prevention curriculum was presented for review and feedback. This vital information was again incorporated into the program as it continues its process to acceptance, printing and distribution. 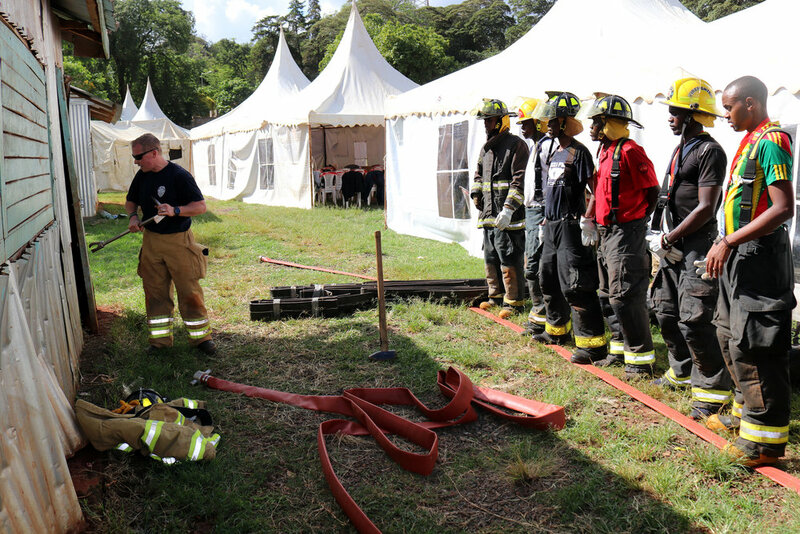 During Africa Fire Mission’s 2014 training endeavor to Nairobi, the Kenyan Stakeholders asked AFM to help them establish a country wide fire training academy and training curriculum. In January 2015, our Executive Director Dave Moore traveled back to Nairobi to continue development of this proposal. 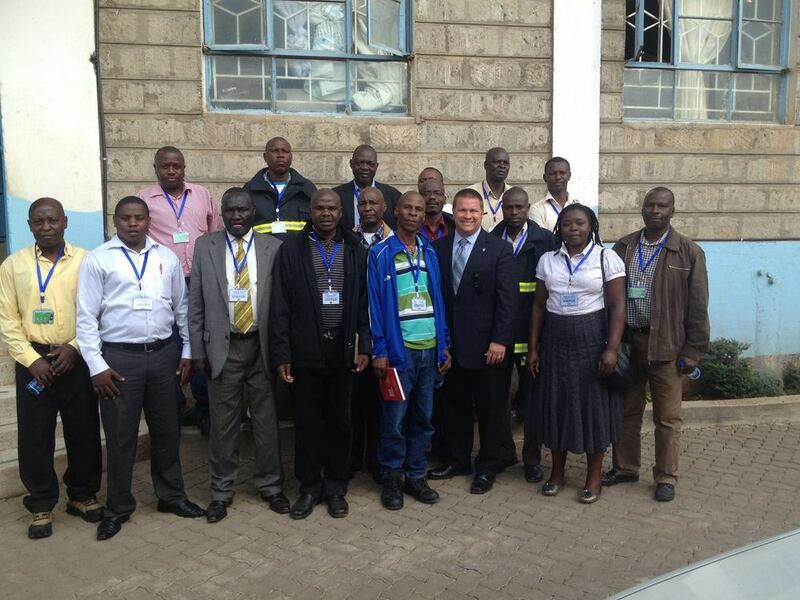 During the week, AFM met with emergency and disaster responders from across Kenya to gain their perspective and insight into creating such an academy. In partnership with the Kenyan Stakeholders, we also met with governmental agencies to gauge their input and potential levels of support for such an endeavor. Stakeholders included municipal fire departments, the Kenya National Fire Brigades Association, St. John Ambulance, The Kenyan Red Cross, Kenya Airport Authority, Legend Impact Communications, National Disaster Management Unit, National Disaster Operations Center, Association of Fire Industry of Kenya, Missions of Hope International, local media and community members. As a result of these meetings, it was mutually agreed that a weeklong training academy would be held in November of 2015 as a beginning to the longer process establishing a physical fire academy and curriculum. The Kenya Airports Authority agreed to host the training sessions at the Jomo Kenyatta International Airport in Nairobi, Kenya. 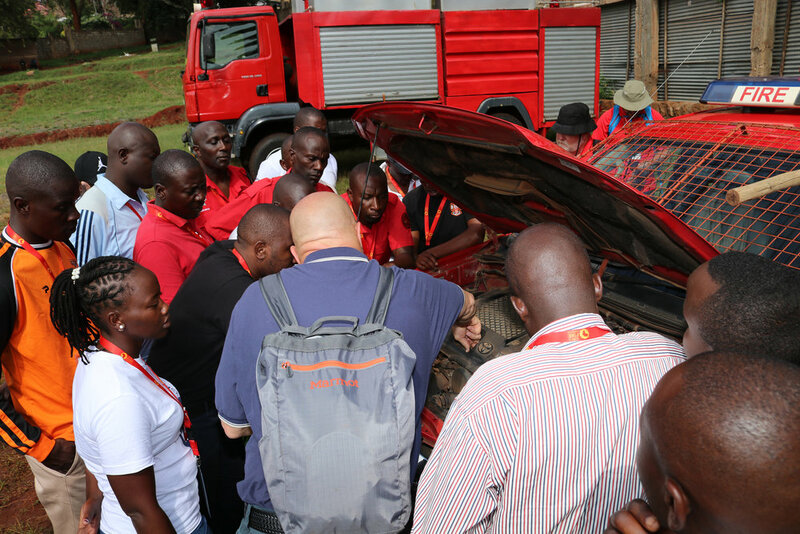 Africa Fire Mission would coordinate instructors for 4 topics areas that were to be chosen by the consensus of the Kenya emergency responders. KENFIBA would coordinate with the response agencies across the entire country of Kenya to ensure they were all aware of this training opportunity and to manage registration for the 200 students this academy would train. 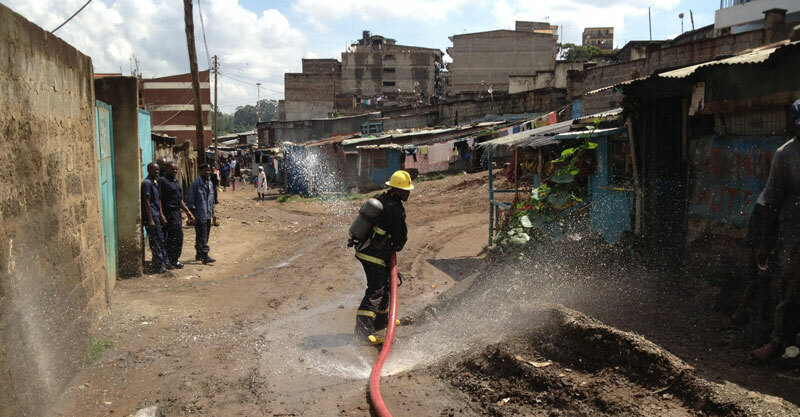 At the conclusion of these meetings, AFM presented a draft of a fire prevention curriculum aimed at reducing fire risk in the slum communities of Kenya to Missions of Hope International and the Nairobi City/County Fire Brigade for their review and feedback. 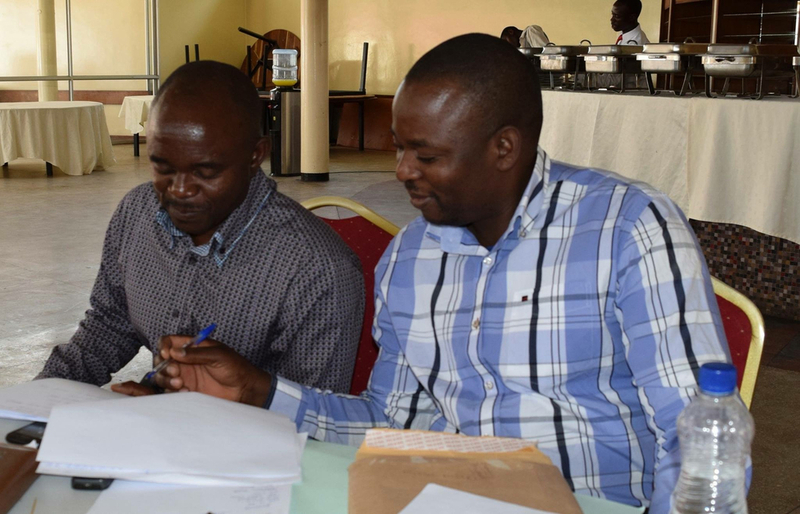 Their input was recorded and presented back to the curriculum developers so that the program could be changed to better meet the needs of those who will receive the training. Our mission started with collecting gear and raising funds to send a 40 foot container of personal protective equipment (PPE) and other mission supplies. The container shipped in July. The container arrived to Missions Of Hope International (MOHI) in October. Our team arrived in Nairobi on November 1st. 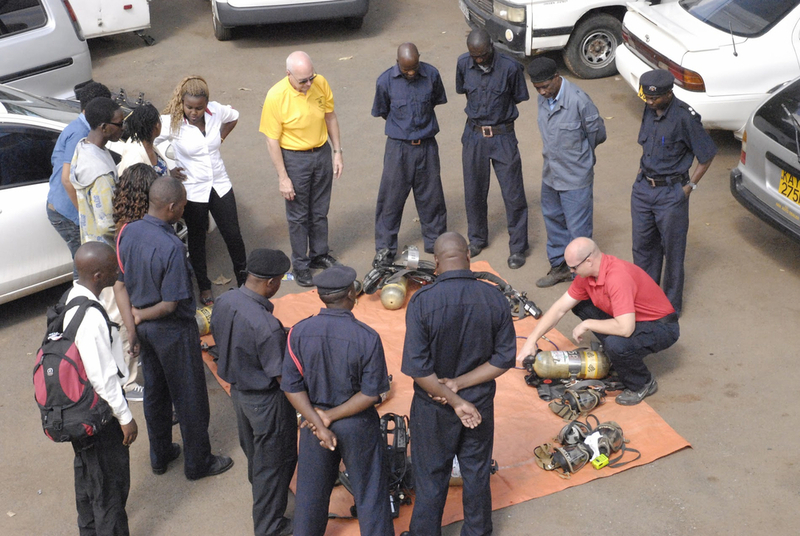 Our team of trainers (Matt Flagler, Bob Rielage, Todd Rielage), spent most of the week training all of the shifts of the Nairobi Fire Service (NFS) in the use and maintenance of SCBA's (Self-Contained Breathing Apparatus). On Friday, November 7th, Bob Rielage, Nancy Moore and Matt Flager worked with the CHE (Community Health Evangelism) trainers from MOHI to begin development of a Fire Prevention program that meets the needs of the Urban Slum communities in Africa. 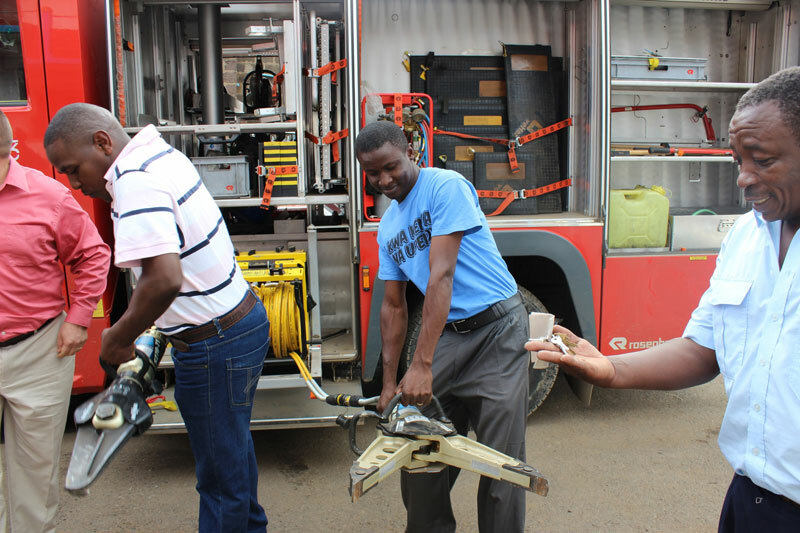 Nairobi Fire Service sent one of their Fire Prevention Specialists and a partnership is being developed for NFS, MOHI and AFM to complete the development of the program to include training for CHE trainers and tools for them to use with community members. Saturday, November 8th the AFM and NFS worked with the larger team from Lifespring Christian Church to have a community "Fun Day." NFS demonstrated the use of their trucks to put out fire and helped to change the image of the fire department in the slum communities. Community education is key to prevention and intervention in the slum areas. While the AFM team was training in Nairobi, Dave and Nancy Moore traveled to Lodwar to meet with county officials and begin assessing how AFM can assist in developing a fire service for Turkana County. We had a productive trip meeting with various County officials, a member of Parliament, and members of the Business Community. Plans are in development for how AFM can serve the people of Turkana. 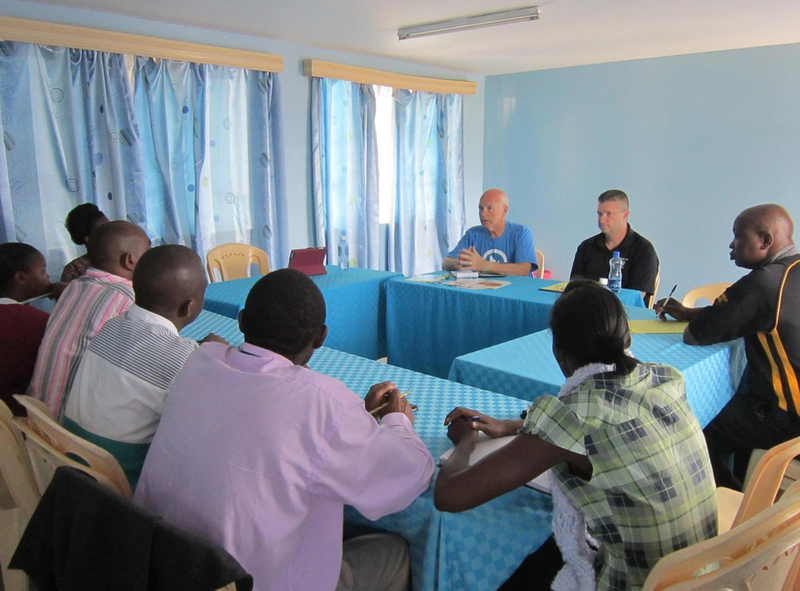 On Friday, November 7th, Dave Moore and Wallace Kamau (MOHI) met with the Emergency Management Staff of Machakos County. 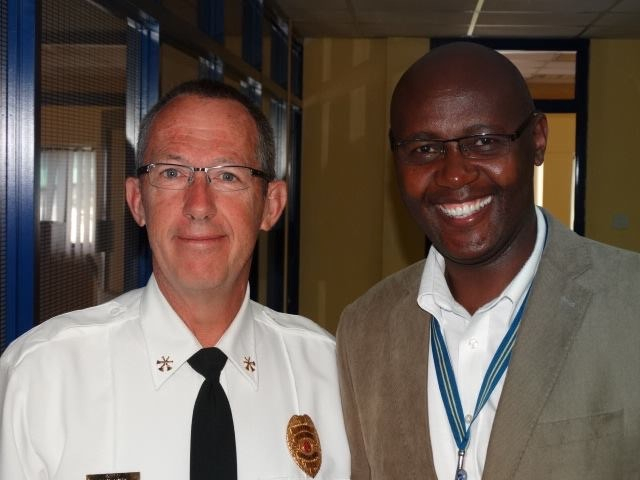 We toured the only working 911 center in Kenya and facilitated a question and answer session with their staff. Africa Fire Mission was able to donate PPE to the fire department and began planning for a regional fire academy. We were impressed with the emphasis that Machakos County is placing on emergency management and look forward to partnering with them in the future. 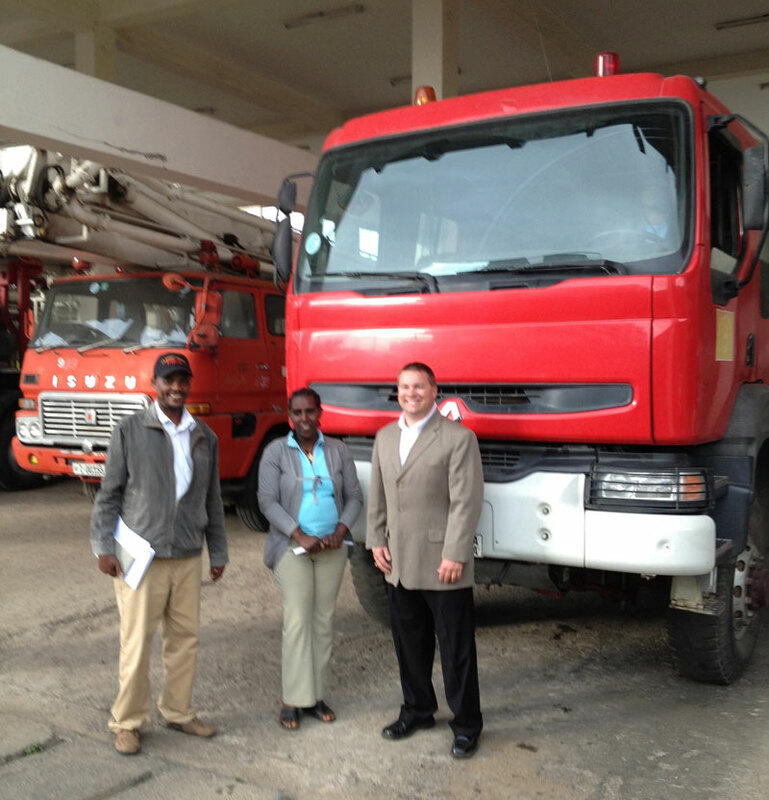 In November, 2013 Africa Fire Mission delivered fire fighting equipment and gear to the Nairobi Fire Department. 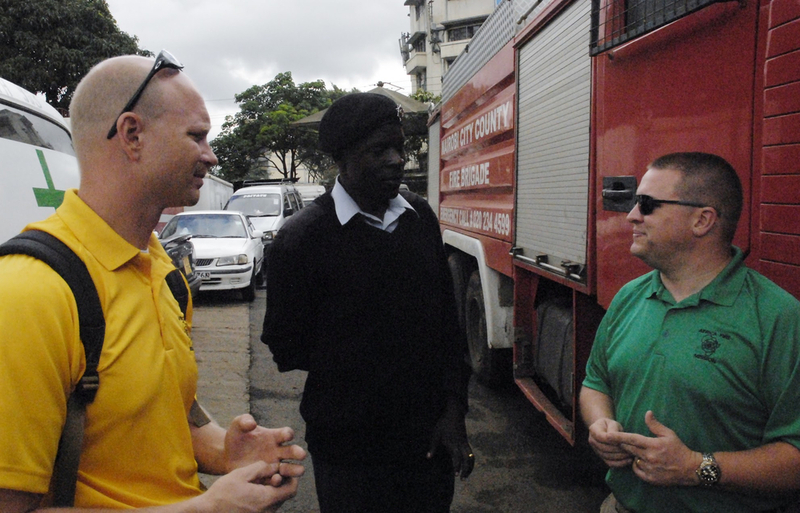 Three Africa Fire Mission team members traveled to Nairobi to participating in training with their Fire Department. 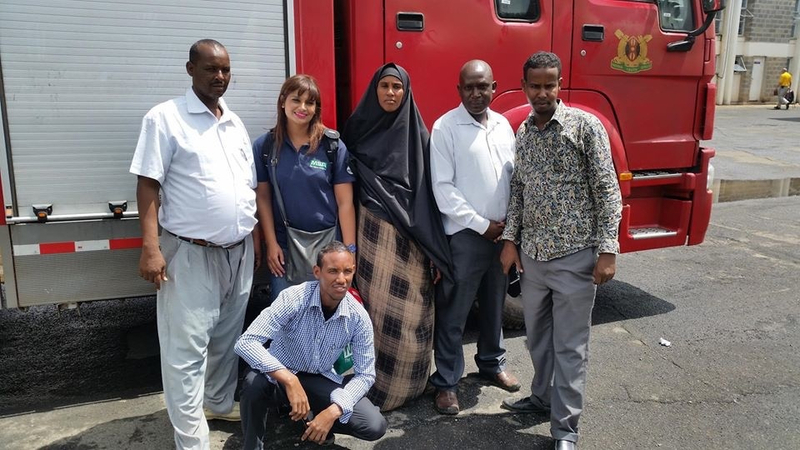 In partnership with USAID and the US Forest Service International Programs, AFM conducted a top to bottom assessment of the fire services in Addis Ababa. We provided recommendations for increased staffing, station placement, staff development, legislation and establishment of a fire academy. 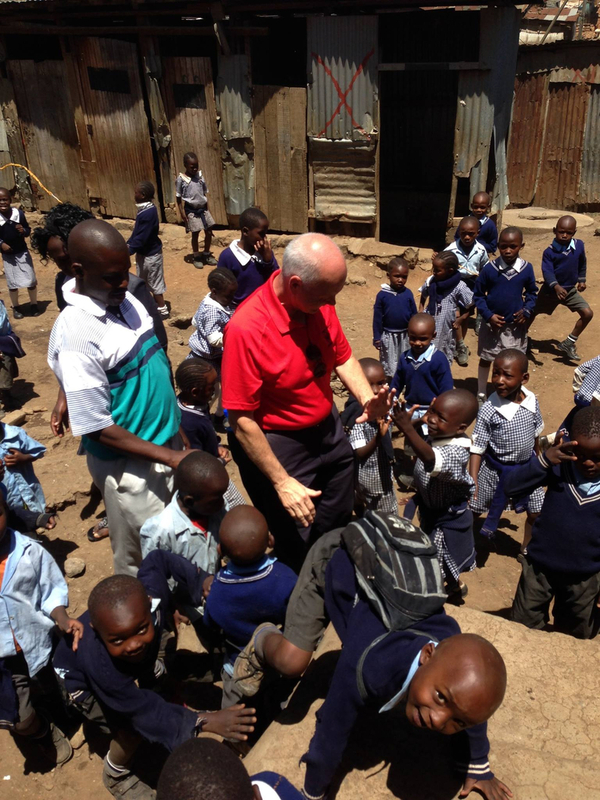 In November 2012, Dave Moore, founder of Africa Fire Mission, and Jeff Johnson traveled to Nairobi for the first time.